USGS scientists collecting and processing ground water samples for Cr(VI) analysis at Edwards Air Force Base, California. 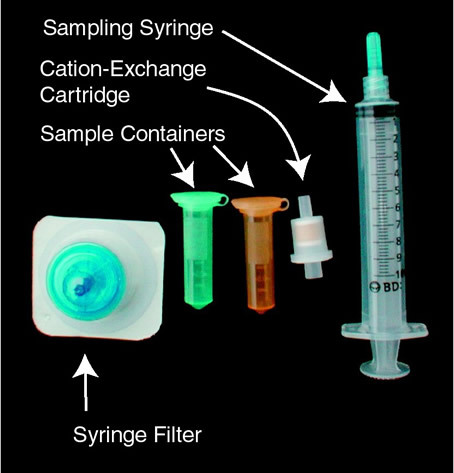 the use of common laboratory equipment that reduces the analytical cost. The results of the new field method compare well with standard laboratory-based methods. 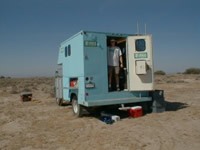 USGS mobile laboratory truck on site at Edwards Air Force Base, California. The new method has been used to characterize chromium-contaminated ground water beneath the Mojave Desert, California, at 29 Palms Marine Corps Air Ground Combat Center, Edwards Air Force Base, and at the Sheep Creek Fan west of Victorville, California. The study found areas with high concentrations of Cr(VI) from natural sources, in addition to Cr(VI) contamination from industrial activities. The natural Cr(VI) is caused by the weathering of dark rocks, such as basalt and amphibolite, in alluvial deposits (sediments deposited by rivers and streams). In addition to distinguishing between the kinds of chromium, knowing the source of Cr(VI) is important to those tasked with cleaning up contamination and protecting drinking water resources. Resource managers can now consider sources of Cr(VI) when determining the responsibility for cleanup, the levels of cleanup required to reach background concentrations, and the regulatory structure for dealing with the contamination. Ball, J.W., and Izbicki, J.A., 2004, Occurrence of hexavalent chromium in ground water in the western Mojave Desert , California: Applied Geochemistry, v. 19, p. 1123-1135. Ball, J.W., and McCleskey, R.B., 2003, A new cation-exchange method for accurate field speciation of hexavalent chromium: U.S. Geolgical Survey Water-Resources Investigations Report 03-4018, 17 p.
Ball, J.W., Izbicki, J.A., and Bullen, T.D., 2003, Stable isotope variations of hexavalent chromium in ground water in the western part of the Mojave Desert, California, USA: Fifth Conference on Applied Isotope Geochemistry, Heron Island, Australia, May 26-30. Ball, J.W., and McCleskey, R.B., 2003, A New Cation-Exchange Method for Accurate Field Speciation of Hexavalent Chromium: Talanta, v. 61, p. 305-313. 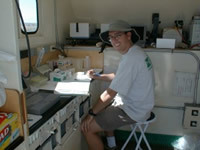 USGS scientist working in the USGS's mobile laboratory truck at Edwards Air Force Base, California.